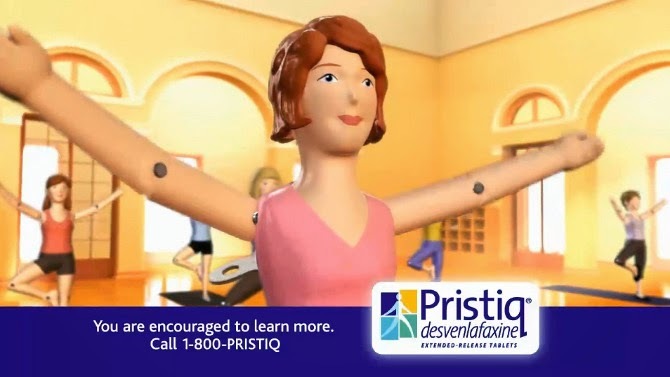 Pristiq's "wind-up doll" ad campaign has been criticized for various sins over the past few years, but my friend's point was unique: In this ad, all four of the depressed women wear long skirts and long sleeves. All four of the happy women wear pants or shorts, and two of them have no sleeves. Of course, a commercial for medication is not a planned statement against the tzanua [perhaps best translated as "private"] attire traditional among observant Jews. However, I think this ad demonstrates a negative social stereotype which casts tzanua dress in a bad light. As reflected in this ad, people tend to view long skirts and long sleeves as signs of negative body image, or avoiding the world's gaze. This is upsetting, of course. From a traditional Jewish perspective, being private - with one's body, one's thoughts, one's life - is an active choice, designed to promote self-development and a strong relationship with Gd. Tzanua conduct isn't supposed to be about flight from the world or a sign of insecurity. Tzniut is a healthy lifestyle decision, whether regarding the way one dresses, or the way one speaks, or the way one socializes. I find the message this ad sends regarding tzanua dress, and tzanua conduct in general, depressing. From time to time, I hear people call the Omer a "sad time". Of course, this is a reasonable conclusion from the absence of music during the days between Pesach and Lag ba'Omer, but in truth, sadness is not what the Omer period should represent. True, we commemorate the death of Rabbi Akiva's students (Talmud, Yevamot 62b), as well as other historic catastrophes which occurred during a period of time that coincides with the Omer. Nonetheless, as presented in the Torah, the Omer is something entirely different. There is a second popular misconception regarding the Omer: that we are counting the days until we receive the Torah at Sinai. True, the Omer count concludes, on our calendar, with the fifth of Sivan, and we received the Torah on either the 6th of 7th of Sivan. (Talmud, Shabbat 87a-88a) However, the Torah (Vayikra 23:9-22) does not present this as the reason for counting. As commanded in the Torah, from the time we first settled the land of Israel we were to bring G-d an annual offering from our new barley, on the 16th of Nisan. Then, we were to count 49 days while harvesting the year's new wheat, and on the 50th day we would bring an annual offering to G-d from our new wheat. In other words: during the Omer period we count the days until we are able to bring G-d a present. This is the reigning emotion of the Omer: joyous anticipation of an occasion when we will be able to offer G-d the fruit of our efforts, when we will stand in the Beit haMikdash, with loaves of our grain presented before us, and say, "Thank You for all of Your help! As we collect our food from the fields, we dedicate this first portion to You." The Omer count weaves together the humility of one who recognizes Divine aid with the pride of one who can show off results. It blends the generosity of giving a gift with the gratitude of recognizing that we have received a gift from G-d. It mixes the spiritual rite of the Beit haMikdash with the manual labour of the fields. What a wonderful celebration; this theme should never be forgotten, even in the face of the presentation of the Torah at Sinai, or the grief of 33 days. May we soon bring these offerings again! As I mentioned last week, I will be addressing a group of rabbis on Monday on the topic of Physician-Assisted Suicide, Gd-willing. This is in relation to a proposed bill promoting "terminal palliative sedation" and "medical aid in dying". Below please find the source sheet I plan to use; I am grateful to those who submitted suggestions in response to my post last week, publicly and by email. As always when I post a source sheet, I know that the structure of the session will be unintelligible from this page alone. However, you might find the sources themselves interesting, or the bibliography at the end useful. [T]his [religious] line of argument will hardly be regarded as respectable in academic circles, certainly not within legal academic circles. And recognition that this type of advocacy is not respectable becomes a self-fulfilling prophecy. If one regards a certain position as somewhat less than respectable, one does not engage in discourse advocating that position. Failure to engage in that type of conversation confirms its lack of respectability and the wall of separation is thereby reinforced not only as a wall between church and state but as a wall between religion and the public square. Accordingly, religious concerns, even when introduced into the public square, lose their validity. But the converse is also true: Religious concerns presented in public discourse again and again dispel embarrassment and become self-validating. But in order for religion to become present in the public square we must first overcome the reticence from which we all suffer. I would not have gone on at length about this but for that which I heard, and they have explained to me, that Solomon composed a book of cures, such that a person who took ill with a particular ailment could turn to the book, do as it said and be healed. Hezekiah saw that people who became ill did not put their faith in Gd, but in the Book of Cures, and so he hid it away. אילמלי נגדוה לחנניה מישאל ועזריה, פלחו לצלמא. Had the Babylonians whipped Chananiah, Mishael and Azariah, they would have worshipped the idol. "Dignity is so great that it overrides a biblical prohibition." But why not apply Proverbs 21:30, "There is neither wisdom nor understanding nor counsel opposite Gd!" Rav bar Sheva explained before Rav Kahana: The prohibition here is that of, "Do not stray [from the words of the sages]." They laughed at Rav bar Sheva; the prohibition of "Do not stray" is itself biblical! Rav Kahana said: When a great man says something, do not laugh at him. The sages linked all of their words to the prohibition of "Do not stray", and for a person's dignity they permitted violation. ואמר לי מו"ר הגרי"י נויבירט שליט"א... מסתבר שיהיה מותר לחולה כזה לצאת עם המכשיר בשבת, גם במקום שאין עירוב (אך אינו רה״ר גמורה), אם הוא לובש אותו בשינוי־כגון אם הוא כורך וקושר את חגורת הבד מסביב לרגלו או לידו ותוחב שם את המחט... ואמר לי מו״ר שליט״א שיש משום כבוד הבריות בחולה סוכרת כזה כי ללא היתר כנ״ל לא יוכל אף פעם, כל ימי חייו, לצאת מביתו בשבת. אך הוסיף שההיתר הוא דוקא לשם מצוה... עוד א״ל מו״ר שליט״א שאדם שלא בא אף פעם לביהכ״נ או לשיעור תורה ידברו עליו וזה גם נקרא משום כבוד הבריות. Rabbi Yehoshua Neuwirth told me… It is logical to contend that such a patient could go out with the device on Shabbat even without an eruv (in an area which was not a full-fledged public domain), if he would wear it in an unusual way, such as by wrapping and tying the band around his leg or hand and poking the needle into it... And my mentor stated that this is a matter of dignity for such a diabetic, for without this permission he could never, in his entire life, leave his house on Shabbat. He added, though, that this permission is only for a mitzvah… He noted that people would talk about someone who never attended synagogue or Torah classes, and this is also an element of "dignity". סליקא אמתיה דרבי לאיגרא, אמרה: עליוני' מבקשין את רבי והתחתוני' מבקשין את רבי, יהי רצון שיכופו תחתונים את העליונים. כיון דחזאי כמה זימני דעייל לבית הכסא, וחלץ תפילין ומנח להו וקמצטער, אמרה: יהי רצון שיכופו עליונים את התחתונים. ולא הוו שתקי רבנן מלמיבעי רחמי, שקלה כוזא שדייא מאיגרא [לארעא], אישתיקו מרחמי ונח נפשיה דרבי. Rebbe's maid ascended to the roof and said, "The Heavens request Rebbe and the earthly realm requests Rebbe. May it be Gd's will that the earthly realm should overpower the Heavens!" When she saw how often Rebbe had to go to the washroom,removing his phylacteries and then putting them back on, and how he was in great pain, she said, "May it be Gd's will that the Heavens should overpower the earthly realm!" The sages were not silent in their prayers for Gd's mercy, so she took a pitcher of water and threw it from the roof. The praying people paused, and Rebbe passed away. פעמים שצריך לבקש רחמים על החולה שימות כגון שמצטער החולה בחליו הרבה ואי אפשר לו שיחיה. Sometimes one needs to pray for mercy for the patient to die, such as where the patient is in great pain due to his illness and he cannot live. Also, as one requests and prays to Gd for the patient to die, he is also obligated to involve himself in saving the patient and desecrating Shabbat for him, even many times. I wish to receive counsel and guidance regarding my 91-year old mother, who has fractures all along her spine due to osteoporosis. Recently she fell and was bounced around, and since then she has experienced great pains. The advice of the doctors is to sedate her, to prevent pain. According to the doctors she will not return to walking, or to moving her lower body. She can move her arms [only] lightly. However, she is still lucid. The question: May one go along with the doctor's advice and introduce her into sedation to prevent pain? I understand that this sedation would become a permanent state for the rest of her life. Response: The discussion is of a lucid woman. Therefore, this depends exclusively upon her desire, and one should ask her directly. It would seem that nobody may lawfully kill a man in self-defense. For Augustine says to Publicola (Ep. XLVII): "I do not agree with the opinion that one may kill a man lest one be killed by him; unless one be a soldier, exercise a public office, so that one does it not for oneself but for others, having the power to do so, provided it be in keeping with one's person." Now he who kills a man in self-defense, kills him lest he be killed by him. Therefore this would seem to be unlawful. Moving to Division II: May we actively end a patient's life? "From the hand of adam [and from the hand of ish, his brother]" – The Torah doubled the term adam and ish, and also joined the word "brother". Apparently, there are two forms of murder: Harming the victim by avenging one's self upon him, taking his property and the like, or benefiting the victim when he is immersed in great pain and he would choose death over life. Although we see that he is in great pain in his goses state, and it would be better for him to die, still, we are prohibited from doing anything to hasten his death. The world and all in it belong to Gd, and such is His will. One may not wound himself or any other person. שאין נפשו של אדם קניינו אלא קנין הקב"ה שנאמר "הנפשות לי הנה" (יחזקאל י"ח) הילכך לא תועיל הודאתו בדבר שאינו שלו, ומלקות פלגא דמיתה הוא. A person's life is not his property; it is the property of Gd, as Yechezkel 18:4 says, 'The souls are Mine.' Therefore, one's admission regarding something that is not his cannot be effective. [This is even true if the admission would lead not to death but only to lashes, for] lashes are a partial death. Reform Judaism as a polydoxy is a religion that affirms the ultimate moral right of the individual person to exercise authority over her/himself. Stated in other terms, Reform asserts that every person is the ultimate owner of her/himself with the moral right, consequently, to do with her/his mind or body that which she/he chooses to do…It is evident that a Reform Jew has a moral right to commit suicide. They brought him and wrapped him in a Torah scroll, and bound him with vines and kindled them. They brought wool sponges and soaked them in water and placed them on his heart so that his life would not depart quickly… His students said to him… Open your mouth and let the fire enter! He said to them: Better that the One who gave it take it back, and not that I harm myself. The executioner said to him: My master! If I were to increase the flame and remove the wool sponges from your heart, would you bring me to the next world? He replied: Yes. [The executioner said:] Swear to me! He swore. And the war turned heavily against Saul, and the archers found him, and he suffered greatly from the archers. And Saul said to his armour-bearer: Unsheathe your sword and stab me with it, lest these uncircumcised ones come, stab me and mock me! But his armour-bearer would not, for he was very afraid. And Saul took the sword and fell on it. It is also possible that a Noachide is not prohibited from such murder, for it benefits the victim. In this regard, the prohibition for a Noachide may be different from that of a Jew. Although Rabbi Chanina would have been required to expend his entire fortune in order to avoid that transgression he was not obliged to accept the greater burden of prolonged suffering entailed by a slow death at the stake. One of us (MDT) has suggested that, as an extra measure of cruelty not mandated by the Emperor or Governor, the Executioner had placed the wads of wet wool and had lowered the flame. "Burning at the stake" had a formal protocol which was not followed by the cruel Executioner. Restoring the flame to its original intensity is not considered an act of hastening death but merely the removal of the extra measure of cruel torture introduced by the Executioner. Suicide was permitted for him, as seen in a midrash, "'But only, your blood for your lives I will seek; from your lives I will seek your blood.' I might say this even for one who is pursued, like Saul? For this reason it says 'But'." Therefore, he was not within the category of willful suicide. "Hard cases make bad law"
· Who advises the patient? The vote on Thursday by Belgium's House of Representatives removed all age restrictions on the right of the incurably sick to end their lives, a vote that has caused considerable controversy. Reviews 42 studies concerning the relationship between nonfiction media reporting and portrayal of suicide and actual suicidal behavior and ideation. Studies of nonfiction newspaper, television, and book accounts of reported suicide were examined. Results show an association between nonfictional media portrayal of suicide and actual suicide. The association satisfied sufficiently the criteria of consistency, strength, temporality, specificity, and coherence for it to be deemed causal. Adequate interventions exist to control pain in 90 to 99% of patients. I have had two clients whose fathers signed up for the lethal dose. In the first case, one side of the family wanted the father to take the lethal dose, while the other did not. He spent the last months of his life caught in the middle and traumatized over whether or not he should kill himself. My client, his adult daughter, was also traumatized. The father did not take the lethal dose and died a natural death. In the other case, it's not clear that administration of the lethal dose was voluntary. A man who was present told my client that his father refused to take the lethal dose when it was delivered ("You're not killing me. I'm going to bed"), but then took it the next night when he was high on alcohol. The man who told this to my client later recanted. My client did not want to pursue the matter further. but the person so attesting is a competent witness to prove the execution of the will or its validity or invalidity. R.S.O. 1990, c. S.26, s. 12 (1).